Products - Equissage International​ Inc. Listed below are the products we offer. Also listed are links to pay for any of our programs. Please note, an application must be submitted prior to sending your payment if enrolling in a program. No application is necessary to purchase dvd's or the book. 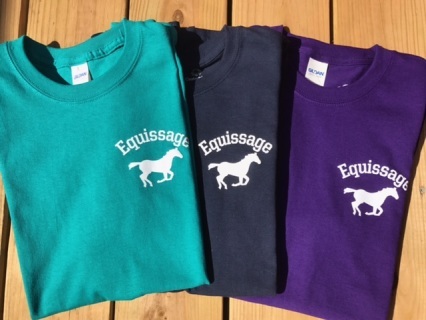 Considered the "Bible" of Equine Sports Massage, this best seller has sold more than 5,500 copies and has been translated into 3 different foreign languages. It is the all time best selling DVD on the application of Equine Massage Therapy. 55 minutes. DVD developed specifically for use with the certificate program in Canine Massage. It is available and sold separately. 45 minutes. 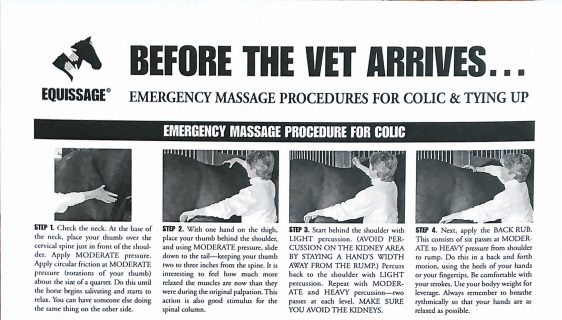 Before the vet arrives with the needed medication, these massage techniques good to know. What is pictured is not a full size rendering. Only the first four steps are listed.